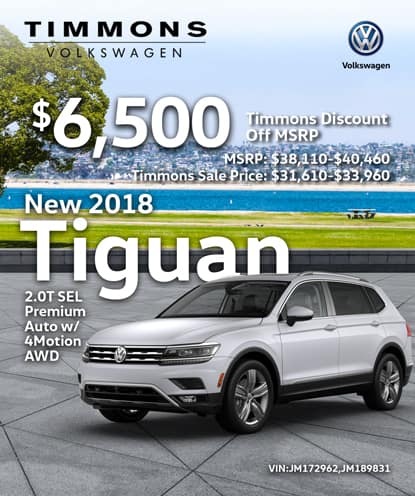 If you’re looking to take on the streets of Long Beach in a new Volkswagen, be sure to rely on the current Volkswagen special offers available at Timmons Volkswagen of Long Beach. When you work with our friendly sales staff and knowledgeable finance department, you can count on us to find the right model for you at a price that won’t break your budget. Ready to simplify the car-buying process? Then it’s time to head to Timmons Volkswagen of Long Beach to take advantage of our various Volkswagen deals. 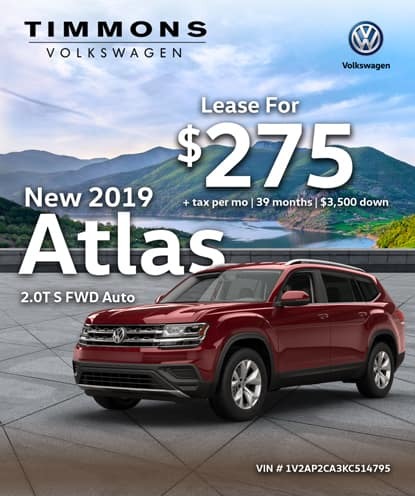 Once you take a look at our available discounted Volkswagen models in Long Beach, be sure to pay us a visit whenever you’re ready to take your favorite model for a spin. If you have any questions along the way, feel free to contact us to learn more about the benefits of leasing or our new vehicle inventory! 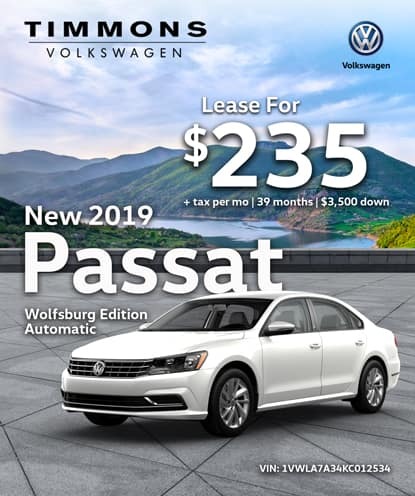 In the meantime, keep an eye out for the offers on the Jetta, Passat and Tiguan! Purchase only. Not available on leases. Plus government fees and taxes, finance charges, dealer documentation fees of $85, any electronic filing charge, and any emission testing charge. 1 in stock: VIN# JC585173. May not be combined with any special rates. Advertised price does not include dealer-added options or accessories. Vehicles subject to prior sale. 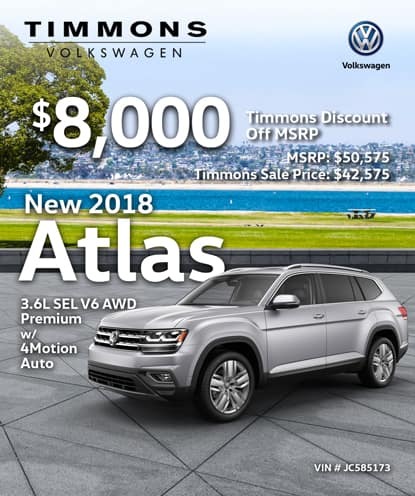 See Timmons Volkswagen to details. Offer ends 3/31/2019. VIN# JC585173: MSRP $50,575 - $8,000 Timmons VW Discount = $42,575 Sale Price. 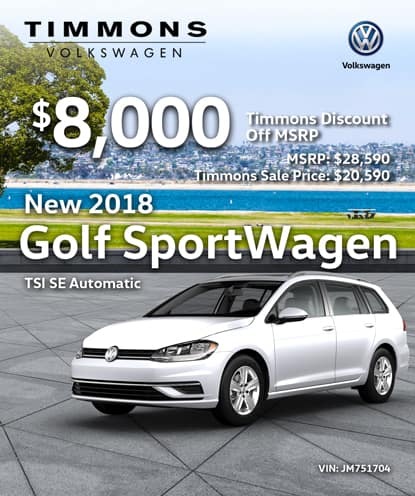 MSRP $28,590 - $8,000 Timmons VW Discount = $20,590 Sale Price. Purchase only. Not available on leases. Plus government fees and taxes, finance charges, dealer documentation fees of $85, any electronic filing charge, and any emission testing charge. 1 in stock: VIN# JM751704. May not be combined with any special rates. Advertised price does not include dealer-added options or accessories. Vehicle subject to prior sale. 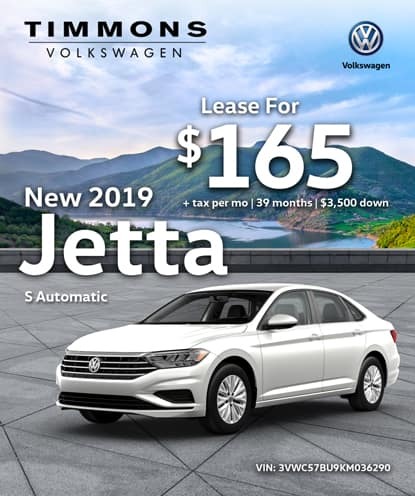 See Timmons Volkswagen to details. Offer ends 4/30/2019. Purchase only. Not available on leases. Plus government fees and taxes, finance charges, dealer documentation fees of $85, any electronic filing charge, and any emission testing charge. 2 in stock receive this offer: VIN# JM172962, JM189831. May not be combined with any special rates. Advertised price does not include dealer-added options or accessories. Vehicle subject to prior sale. 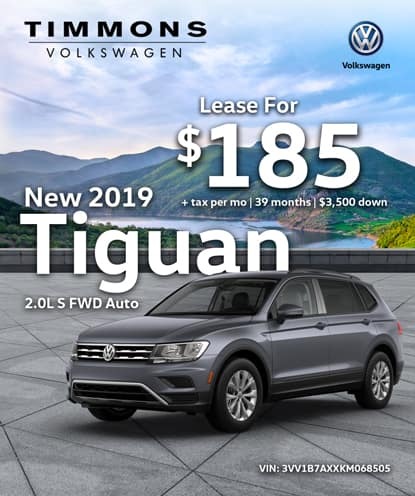 See Timmons Volkswagen to details. Offer ends 4/30/2019. VIN# JM172962: MSRP $38,110 - $6,500 Timmons VW Discount = $31,610 Sale Price. VIN# JM189831: MSRP $40,460 - $6,500 Timmons VW Discount = $33,960 Sale Price. VIN# JM189831: MSRP $40,460 - $7,000 Timmons VW Discount = $33,460 Sale Price. VIN# JM172962: MSRP $38,110 - $7,000 Timmons VW Discount = $31,110 Sale Price. VIN# JM163616: MSRP $38,165 - $7,000 Timmons VW Discount = $31,165 Sale Price. 36 month lease with $3,500 down payment, no security deposit required. MSRP $19,845. One in stock at this payment VIN# KM050931. Lessee responsible for excess wear and mileage over 7,500/year at $0.20/mile. Available on approved, above-average credit. Not all will qualify. May not be combined with any other offer. Excludes tax, title, license, registration, 1st month's payment, options, $625 Acquisition fee and $85 documentation fee. Expires 4/30/2019. 36 month lease with $3,500 down payment, no security deposit required. MSRP $26,060. One in stock at this payment VIN# KM083642. Lessee responsible for excess wear and mileage over 7,500/year at $0.20/mile. Available on approved, above-average credit. Not all will qualify. May not be combined with any other offer. Excludes tax, title, license, registration, 1st month's payment, options, $625 Acquisition fee and $85 documentation fee. Expires 4/30/2019. 36 month lease with $3,500 down payment, no security deposit required. MSRP $27,375. One in stock at this payment VIN# KC012534. Lessee responsible for excess wear and mileage over 7,500/year at $0.20/mile. Available on approved, above-average credit. Not all will qualify. May not be combined with any other offer. All in stock. Excludes tax, title, license, registration, 1st month's payment, options, $625 Acquisition fee and $85 documentation fee. Expires 4/30/2019. 36 month lease with $3,500 down payment, no security deposit required. MSRP $37,410. One in stock at this payment VIN# KC510048. Lessee responsible for excess wear and mileage over 7,500/year at $0.20/mile. Available on approved, above-average credit. Not all will qualify. May not be combined with any other offer. Excludes tax, title, license, registration, 1st month's payment, options, $625 Acquisition fee and $85 documentation fee. Expires 4/30/2019.